WAIST HIGH: OMD To Support The Buggles For Their One-off Concert. OMD To Support The Buggles For Their One-off Concert. Following Trevor Horn's announcement that The Buggles will reform for their first ever full live gig, OMD have announced that they will open the show. Horn said that he is reuniting the original Buggles line-up to perform their debut album The Age of Plastic in full for one night only on Sept. 28 at London's supperclub. The Buggles - The Lost Gig will raise funds for London's Royal Hospital for Neuro-disability. Trevor Horn: "The Royal Hospital for Neuro-disability is a very special cause, one that's close to my heart, and I hope we can use this unique event to raise a great deal of money and to increase awareness for their great work." From OMD: We are thrilled to announce that Orchestral Manoeuvres in the Dark will perform as special guests for The Buggles' one-off fund-raising concert on 28 September in aid of the Royal Hospital for Neuro-disability. The evening will see Trevor Horn reconvene The Buggles for a never-to-be-repeated live performance - their first ever gig, more than thirty years after their debut hit, "Video Killed The Radio Star." And OMD will perform a special support set in a rare appearance in their original two-piece formation. 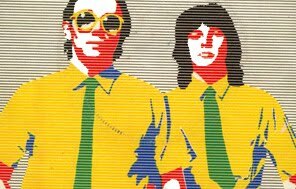 Trevor Horn: "I think what Orchestral Manoeuvres have achieved over the last few decades - that fusion of pop and electronic experimentation - is unique. Both OMD and The Buggles released their debut singles in September 1979, so there's another symmetry for them joining us on the 28th. I'm very grateful to Paul and Andy for agreeing to take part in this concert and I personally can't wait to watch their set."